Easiest way to tell which is which, even without reading anything, is the position of the serial number sticker. If it's at the very top, it's G2. Otherwise it's G1. N.B. 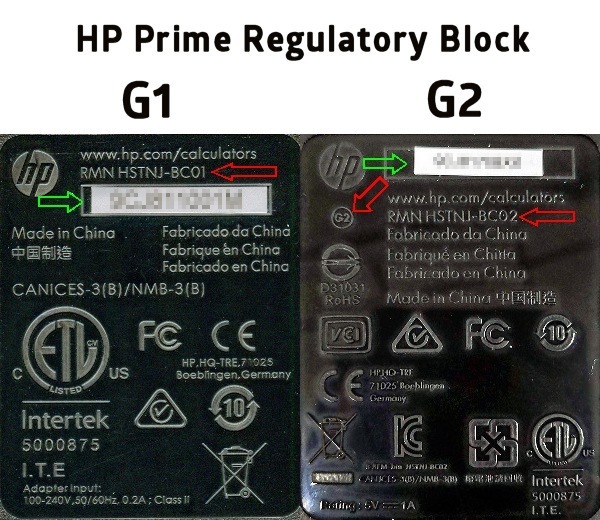 If you have a G2 and its regulatory block differs from the one shown above, please post a photo of yours. Thanks! "Are you sure that that's all [the ways to de-brick them]? No JTAG type re-flashing?" Actually, JTAG does not give you access to the flash. It gives you access to the CPU (JTAG is present on Prime of course). Once you have CPU access, you can then use that to download and execute a program that can access the flash. But this means complete opening and soldering which is one level more dificult than the other methods. I.m not going to open and solder my Prime, but I do have one soldered HP 49G. PS: no exam mode hacking - EVER!